During the Grand Opening of the 2012 Amherst Biennial, Samuel Rowlett will hike from the UMass pond at the Fine Arts Center to Amherst College with an 8' x 6' canvas on his back! He feels that the journey of explorers and artists are linked in their quests. This past summer Samuel hiked up Skinner Mountain to pay homage to Thomas Cole's paining of the Oxbow, Other extraordinary feats this year included a building a canoe at Oxbow Gallery and then paddling down the Connecticut River, exploring a buried river under Hartford. We are delighted to bring Rowlett's performance to Amherst where he will link these two colleges and engage with our downtown landscape with his performance. Rowlett's Performance starts at pond behind Fine Arts Center at 5 PM at UMASS through downtown to Amherst College!!! 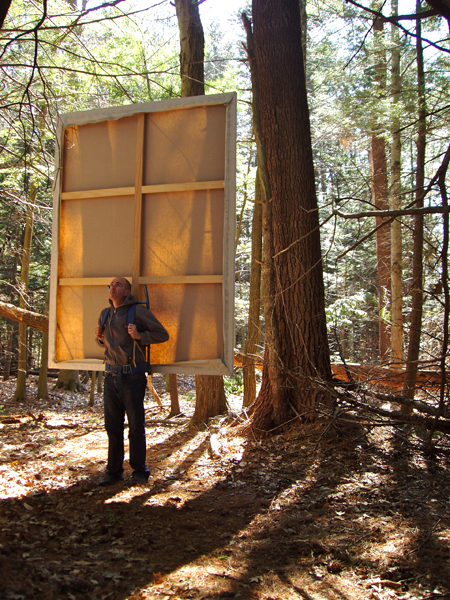 On the following day, Sunday, Oct. 7th at noon, Amherst College will be hosting a rare performance of Karen's Domanisth, who will be an artist-in-resident at the Stearns Steeple where she will building an installation using natural materials honoring sacred texts. Her performance will be featuring an original score composed by Too Human a transplant from Hollywood who collaborated with the artist using natural sounds, instrumentals and the carillon bells to enrich her performance. Dolmanisth's Performance at Quad in front of Mead Art Museum at noon Sunday, Oct. 7th (rain brings performance inside museum). Too Human created an original score for Karen's performance and Aaron Hayden (Selectboard Member) will be ringing the bells in the steeple.